My family has always been very food-oriented. I grew up with pecks on the cheek that came hand-in-hand with a bowl of rice. My grandparents on my father’s side opened up their doors in Vietnam to serve steaming hot bowls of bún bò huê’ that would take the help of all seven of their children—with my dad being the one who was always up first to start the broth. They did this for years until they escaped Vietnam. My cousin, who took refuge in England, ended up following in the footsteps of my grandmother and opened up her studio to host supper clubs and teach Vietnamese cookery. My grandmother on my mother’s side taught me how to cook. My parents raised me and my two siblings to always help out in the house as much as we could, but they never had to ask me to do any of it because I would always just be there. Yes, an associate degree in restaurant management from Orange Coast College in Orange County, CA. 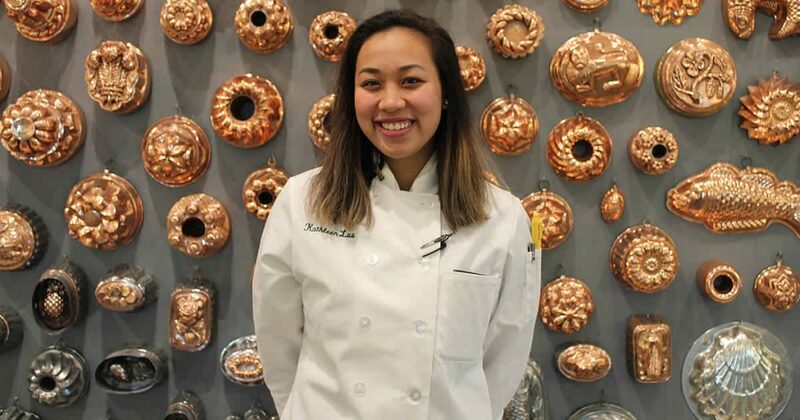 I’ve always wanted to learn and gain a culinary arts degree; I ended up going into restaurant management first so I could learn the business aspect of the F&B industry and have fun later by going to school to learn what I truly had an interest in. I believe that having a good base of knowledge in the business aspect really helped me. Not only did I receive transfer credits, but I excelled in my business liberal arts classes, such as Menus & Managing Profitability and Food Systems. I chose the CIA because I wanted to go to the best school possible for myself while also staying close to home. The CIA stood out to me because not only is it the premier culinary school, but it is the most genuine as well. As soon as I showed interest and started my application, my admissions counselor Allison helped me and encouraged me when most schools have no reason to. Our first conversation was about how we had the same birth date! She was with me every step of the way and even called me personally to tell me that I got in. She was so excited for me and even remembered what I wrote in my admissions essay—in detail. Ever since I set foot onto the Greystone campus, all the chefs, professors, and administration have made the effort to know who I am and who my classmates are. We’re all one big happy family. Everyone here at Greystone knows everyone else and we’re all friendly and cordial with one another. No one is shy to help! I am a resident assistant, a group leader, and a tutor at the Learning Strategies Center. I love to make anything that’s close to my roots—Vietnamese cuisine. I especially love to make pho. CIA has so many different courses for us to take in topics such as food systems, principles of menus, and nutrition. I think these courses have helped with planning a business because it talks much more about business than the food itself. At the end of the day, this is all just food and we’re all here to learn. We could have good days and bad days, but it’s all a lesson! I want to own my own business one day but I would first work in the industry for a while to get experience under my belt and make a name for myself. Know that it’s what you want and that you will give 100% to your education and your career. If you are eager to learn and you are willing to, you will strive here. Don’t be stubborn about changing your ways or learning something new. You will always have something to learn from a new chef, cook, or fellow classmate—whether it is right, wrong, or different, you will always learn something! 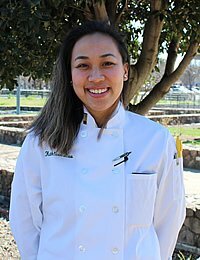 Kathleen Luu is a CIA student pursuing her associate degree in culinary arts at CIA’s Greystone campus in St. Helena, CA (Napa Valley). She is from Huntington Beach, CA.